FREE SHIPPING above S$ 80 today! You save S$ 9.20 (-40%). 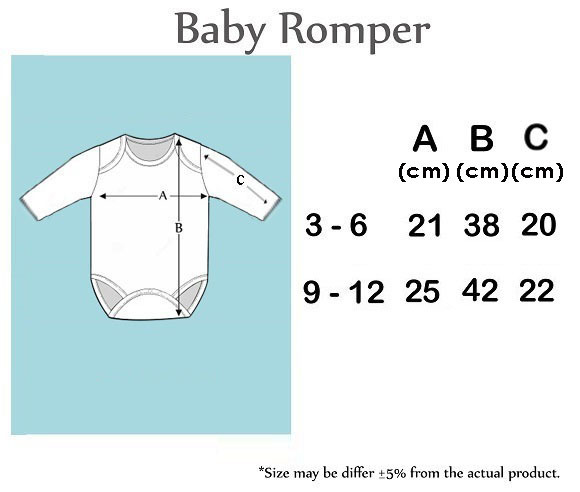 What's the best part of the long sleeve romper for your baby? It is super comfy and stylish too. Allowing your baby to dress in style comfortably. Ordered on 27 Dec 2017 19:34 (Wed) Received on 29 Dec 2017 3pm (Fri) Fast delivery. Good printing. 30% Discount. I like the fabric used. They even considered a small size tag at the back of the neck area. to avoid itching or scarring on the skin. Overall Great! Super fast delivery! Everything was in perfect condition and I'm really satisfied with all the products! Definitely worth buying! What's NOT to love about personalized gifts? This company produces quality stuff. Happy with their delivery service too as it's clearly packaged with care and delivered on time. First time ordering with you all... Seriously Im 10000% satisfied with the items I have ordered... On time delivery, safely packed and exactly as how i requested... Looking into to purchase more with you all... Keep it up this good job. Good Service, Fast Delivery and I love it all! Printcious initially sent me the wrong amount for my order of baby rompers. But they quickly rectified it and sent it to me without much hassle. A+ service! Easy transaction, fast delivery, good quality products, good customer service and overall just a GREAT online gift store! I've received personalised baby romper for my new born niece! Nice and Cute! Also, I've the personalised mini-tee to decorate my car. Really happy to see the results turn out well. Excellent service, quality printing, fast delivery.. Thank you very much guys.. much love! ? Pic was printed nicely on the romper. However, I received this one on a short sleeve. Up to S$ 20 Here !